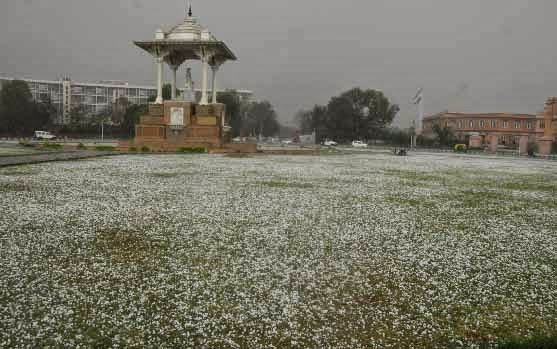 Jaipur : Twenty five people have been killed and about 90 were injured in accidents due to unseasonal heavy rain and hailstorms in Rajasthan over the past few days with more than three thousand villages reporting loss of half of the crop production. Officials said heavy rain and hailstones the size of golf balls damaged Rabi crops of wheat, barley, cumin, mustard, gram and potato as well as vegetable farms in the countryside that feed Delhi and all major urban centres in western and northern states. In a video-conferencing yesterday, Rajasthan Chief Secretary CS Rajan directed Divisional Commissioners and District Collectors to conduct surveys in the district affected by rain and hailstorm, and prepare 'Girdawari report' at the earliest to asses actual losses to crops, according to an official statement issued in Jaipur. The Chief Secretary also reviewed the relief work and gave necessary directions to the officials, according to a release. The Rajasthan Calamity and Relief Minister GC Kataria today told the House that 25 people died along with over 166 cattle and 1,315 livestock animals killed in the rain-related incidents so far. Affected crops include cumin, coriander, orange, Isabgol, garlic, wheat, and mustard seeds crops in 4,247 villages, the statement mentioned, adding, more than 50 per cent crop damage was reported in 3102 villages. Principal Secretary, Relief, Rohit Kumar said that efforts were on to provide relief to affected farmers. Additional Chief Secretaries Ashok Sampatram, Shreemat Pandey, Principal Secretary Rajeshwar Singh, Secretary Rural Development Rajiv Thakur, Secretary Revenue Alok were also present with the Chief Secretary during the video conferencing.